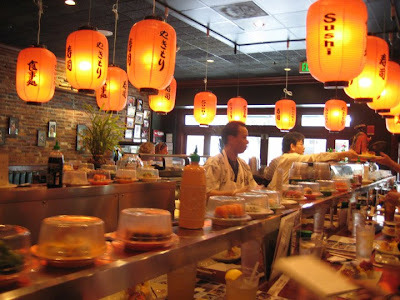 Did you realize that downtown Towson is a hotbed for sushi restaurants? Mr Minx and I started noticing that when we moved into the area - there are several stand-alone sushi joints, plus a few Chinese restaurants that also serve the popular treat. 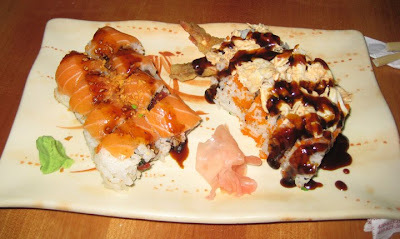 Even Purim Oak, a Korean restaurant that once stood on the corner of York and Chesapeake (now Café Spice), had sushi. And although many restaurants serve sushi, every place is different in its own way. 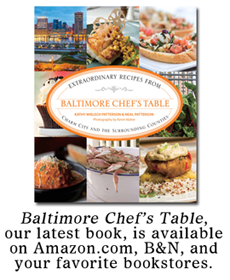 I learned a bit about four restaurants on a recent tour, Towson on a Roll, sponsored by Baltimore County Conference and Tourism. Next on the tour was Kyodai Rotating Sushi Bar. I must admit when I first heard about this place I was skeptical. It's a gimmick, right? But owner Tony Yan says the real trick, once you entice them in, is getting customers to return. And that he does with quality food and good service. It's been working for him, because Kyodai has been open for five years now. This is especially impressive because of his location - in the mostly-abandoned Towson Commons building. Once a thriving shopping and dining destination, the building now contains mostly offices, plus a used bookstore, a multi-screen movie theatre, and Kyodai. Despite this, Mr Yan says his customers come from all over, including Pennsylvania and DC, in addition to neighborhood regulars. One customer, who was enjoying lunch as we visited, remarked that he likes the expediency with which he can eat at Kyodai - he doesn't have to peruse a menu or wait for his order to be prepared. He simply decides on a few items in rotation, eats, and goes. And speed is always a plus for a workday lunch. 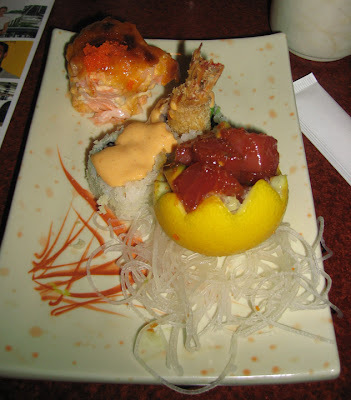 We were served three items: Salmon Imperial (top), lightly cooked, meltingly-tender salmon wrapped around a ball of imitation crab and topped with broiled Imperial sauce; shrimp tempura with spicy mayo topping (center); and tuna tartare, lightly marinated in soy and sesame and served in a hollowed-out lemon. 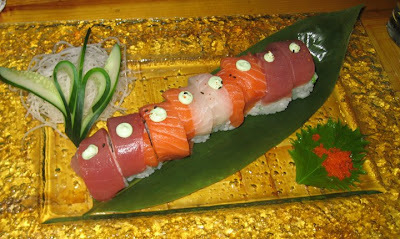 I especially enjoyed the tuna, which was a deliciously different way of having sashimi. We were also invited to try anything we wanted from the dishes going around the conveyor belt. 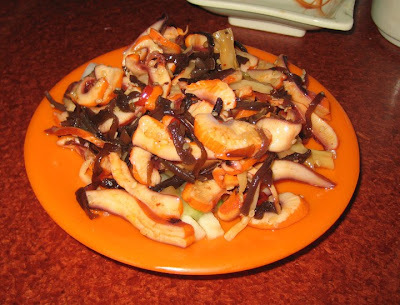 This dish was most intriguing - squid salad. It had the flavors of seaweed salad with lots of ginger, and the squid was pleasantly chewy. So you're probably wondering how the whole rotating thing works, right? Simple - you take whatever dishes look appealing and when you're done, your dishes are separated by color and counted. Prices per dish range from $2.50 to $5.95. The third stop on our tour was across the street at San Sushi Too, companion to Thai One On next door and the sister restaurant to Sushi San/Thai Jai Dee in Canton. Another relative old-timer in Towson, San Sushi Too has been in that location for 12 years. Owner Bruce Sesum takes pride in the fact that they have many regular customers and says that is in part due to his staff. Customers feel at home when they see familiar faces in a restaurant, and Sesum's crew has very little turnover. From a personal standpoint, I definitely prefer a familiar server to the manufactured friendly one gets from chain restaurants where the staff squats tableside or sits down beside me. We were served two rolls: the Sarah roll, which had spicy tuna, avocado, and roe on the inside and topped with fresh salmon, crunchy fried garlic and Hawaiian barbecue sauce; the Terp roll was filled with shrimp tempura, avocado, tobiko, and scallions and topped with fresh crabmeat and a sweet teriyaki sauce. It was hard to stop eating both of them, but we still had one more stop to make. The last stop of the tour was to Sushi Hana. Owners Po and Gina Chan have a second location at Lake Falls Village on Falls Road, which I will confess is the sushi joint we visit most regularly. We love the variety of rolls they serve and have difficulty limiting ourselves to just two or three. Or four. 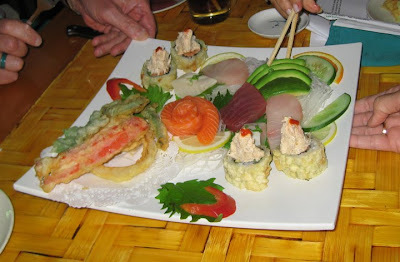 The Towson location, like San Sushi, has been around for 12 years, and stresses presentation as well as quality and service. 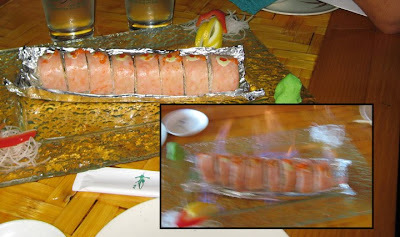 That was evident with the Roll on Fire, which was, as you can see in the inset photo, on fire. The roll of lump crab, Old Bay, and avocado topped with shrimp cake is placed on foil into a lake of 151 proof rum, which is then set aflame. I'm happy to report that no eyebrows were lost during the consumption of this meal. 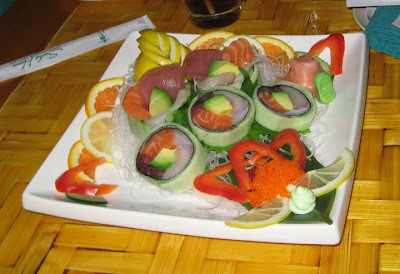 The above is a unique type of rainbow roll with calorie-counters in mind - there is no rice, the yellowtail, salmon, and tuna are wrapped in cucumber, which made for an interesting and refreshing dish. This was a selection of sashimi, tempura vegetables, and something called the "I Like That Roll," which was tempura-fried and topped with crab. 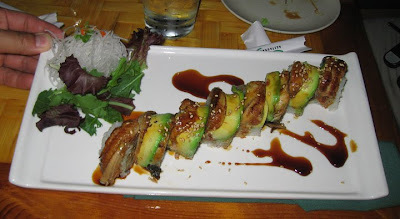 We also tried the Golden Roll of tempura shrimp topped with eel and avocado. And finally the Hit Roll, filled inside and out with fresh raw fish and topped with dollops of wasabi mayo. 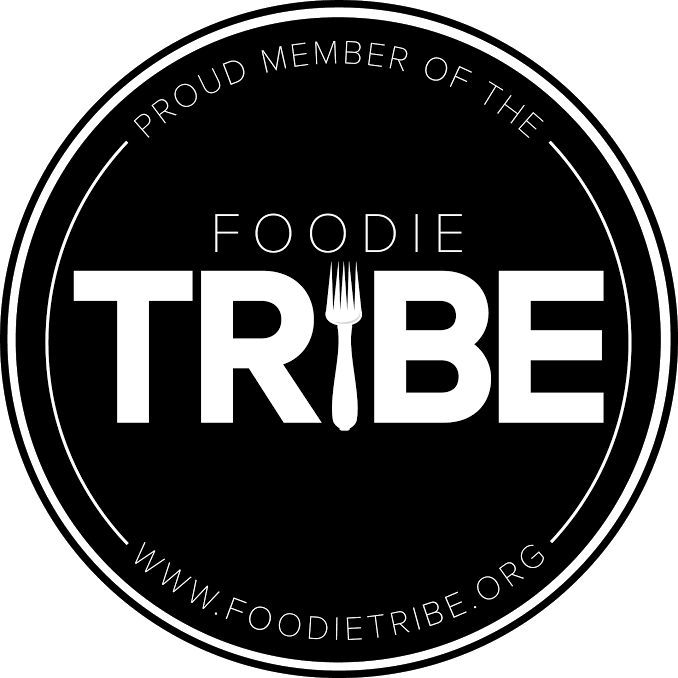 Overall, I was impressed with the quality and freshness of ingredients at all four restaurants, which of course should be paramount when serving raw fish. And despite the ever-present shrimp tempura-style rolls, each restaurant chose to feature quite different items. The Orient focused on the more traditional whereas Kyodai gave us something a little different. San Sushi Too fed us customer favorites that featured some of their house-made sauces, and Sushi Hana wowed us with their beautiful plates. LOL Dara - I do what I can to stay sane. No energy pills...I can't even drink caffeine! I love your blog! The reviews and the post TV recaps are just what I need to cheer my day. Now I am hungry for sushi- Wish I lived in your area. We have some good ones here also but the large fancy (so Cal) aren't that great it is the holes in the wall and mom and pop ones I seek out. Never gotten any bad fish yet! Hi Shirley! Neal and I went to Kyodai for dinner tonight and I told Mr Yan my post was up. He made a special dessert roll for us with yellowtail inside topped with sliced banana and roe. Nice guy. I think we'll be regulars.